As part of the Flatiron/Parsons design build team, AE3 provided landscape architecture for the Oakland Airport Connector (OAC) project. The OAC project is an Automated Guideway Transit (AGT) system that connects the BART Coliseum Station to the Oakland International Airport. 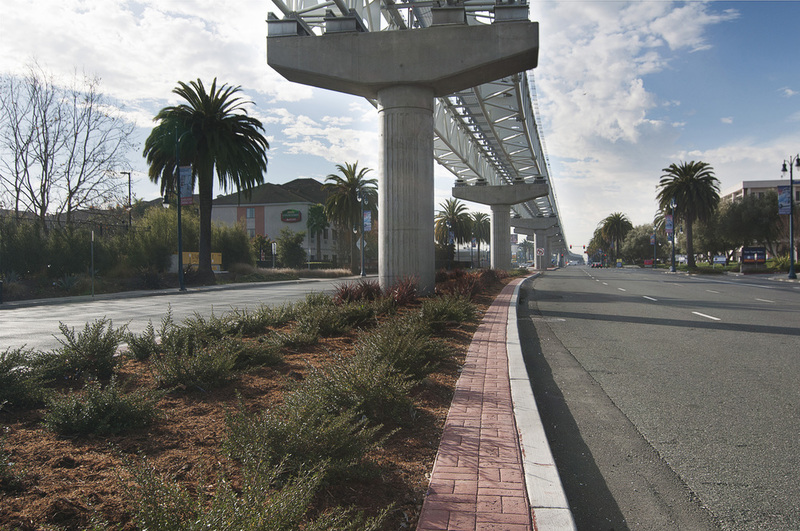 AE3 provided median and landscape architecture design along Hegenberger Avenue using a drought-resistant, native plant species selection, as well as soil amendment, tree removal, irrigation, and hardscape for the 3.2-mile above-grade track. The landscape design needed to reconcile the often conflicting species/irrigation requirements for several different agencies including Caltrans, City of Oakland, and the Port of Oakland. Our team developed an approach with several agencies to successfully implement design for landscape medians, pedestrian/bike paths, stations, and a maintenance facility.